An excellent video recorder - Any Video Recorder enables you record screen videos and desktop activities with high video and audio quality. You can record either the entire desktop, windows, or any specific area. 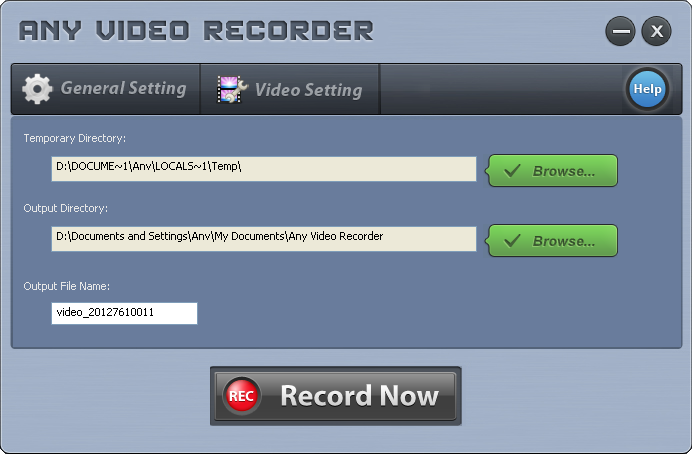 How do I record video with Any Video Recorder? Any Video Recorder is a free video recorder. Download this recorder and install it to capture desktop activities or videos. Here is the main window of Any Video Recorder. Before recording, you can set the temporary directory, output directory, output file name, video frame rate and bit rate. When everything is ready, click the "Record" button. And the following window will open. When the video is played back, Any Video Recorder can automatically detect the video area. Or you can select the video areas manually. After selected the video area, you can click on the "REC" button to start recording.